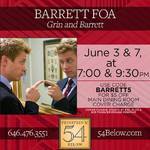 I had the complete joy of getting to attend Barrett Foa's newest cabaret show Grin and Barrett which made it's New York City debut on Friday, June 3 at Feinstein's/54 Below. It was GREAT to see Barrett back on stage, singing his heart out, and enjoying the live audience he loves performing for. Barrett's show was the perfect blend of music and behind-the-scene stories from his theatrical endeavors and time so far on NCIS: Los Angeles. From musical theatre numbers to standards, pop, and rock covers, Barrett wowed the crowd throughout the evening! A few musical moment highlights were his "BFoa Medley" which comprised of songs by Madonna, Coldplay, Cher, WHAM!, Bryan Adams, The Beatles, and a few musicals as well as his "Underdog Medley," "Finale," and "Encore." I don't want to give too much away, but after the show, I told Barrett that he NEEDED to record his encore and release it as a single (I hope you listen to that advice)! 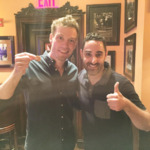 Barrett Foa and Call Me Adam at "Grin and Barrett" at Feinstein's/54 Below in NYCWhat makes Barrett such a dynamic performer is the way he seamlessly moved between songs and stories. He had a great flow to the evening. My favorite story of the night was, what I felt to be, his most personal story of the show. He talked about the "hardships" of growing up with a name like Barrett Foa and how the kids at school teased him a lot. I related a lot to that story, not because people made fun of my name growing up, but because they made fun of me and my personality traits. But what an amazing feeling it is to get past those days and realize what a unique gift we each are to this planet. And when you are able to turn that hurt into laughter and learn how to truly be the joke a step ahead of everyone, well, that is the greatest moment of strength there can be. Barrett may have been cheated by many as a kid, but he made up his mind and had it come to end. Look at him now, starring on a hit TV show, delighting audiences over the years on stage, and now, creating this cabaret show as a love letter to himself is probably the biggest reward he can give to both himself and to us, the audience! Barrett FoaGrin and Barrett will play one last performance here in New York City at Feinstein's/54 Below on Tuesday, June 7 at 9:30pm! Click here for tickets, if you can still grab one! For those of you on the West Coast, Barrett will be coming your way on June 24 and June 25 at Feinstein's Nikko in San Francisco! Click here to get tickets! If you missed my interview with Barrett about this show, you can read it here!